Final Fantasy is a saga devoted to telling epic stories with magic, sword battling, and plenty of plot twists. In every game, the user controls a central character. The main character is typically a young boy, who has some special connection to a powerful force in the Final Fantasy universe. Throughout the game, the hero joins with others devoted to his quest; this is the hero’s party. With this party of characters, the user wanders through mazes and fights strange monsters. I have been a devout follower of the Final Fantasy series for quite some time. I beat Final Fantasy VII in the sixth grade; I have since logged countless hours, controller in hand, battling terrible monsters and strange villains. Square Enix’s latest release, Final Fantasy XII, had been waiting on the horizon for too long. Every time I visited the mall, I checked into the game store to see if the release date was posted. Fortunately, my personal quest for Final Fantasy was fulfilled. FFXII is an interesting turn for the Final Fantasy franchise. The tale begins in the kingdom of Dalmasca. The independent realm is forced into war with the “all powerful” Archadian Empire; Dalmasca is overwhelmed by the Archadian Empire. The first cut scene (the first of quite a few) cuts to the assasignation of the King of Dalmasca. Without a successor to the throne, the city falls under the power of the terribly tyrannical Archadian Empire. Once the lengthy cut scene ends (skip it if you are impatient in the least), I assume control of a young Dalmascan boy, Vann. The Archadian Empire killed his brother, so Vann is rather upset with the government. He decides to take his revenge by stealing some precious treasures from the kingdom and selling them in hopes of buying a real airship. He meets some adventurers with their own airship and all kind of mayhem ensues. All in all, the story is similar to most other games- save the world. The most notable change made to the Final Fantasy structure is the new fighting system. As opposed to the older titles, which use turn based combat, FFXII has a real time combat interface. The fight can be paused at any moment in order to command an attack, action, or spell, but the lengthy process of choosing an action for every character has been eliminated. This is great for gamers who want to play Final Fantasy but have attention span problems. For those of you out there, your prayers are answered. This change gives the game a real hack and slash appeal; chopping away at monsters is always fun. Without the traditional turn based style, a user needs a way to control his whole party. FFXII has introduced a system of control called gambits. Gambits are pre-determined actions to guide a party member. For example, I control my primary character and I set my party member’s gambits to heal me when I am hurt. Party members will reliably perform their set duties. This can particularly helpful when dealing with a difficult enemy, or fighting when there is little time to control each character’s actions. Gambits can be purchased in each town; the user obtains more options in order to make a character more flexible in battle. Random battles have always been a consistent component of Final Fantasy. The user typically cannot see where enemies are and will be required to fight on a random basis. With the release of FFXII, Square Enix has done away with the random battles. The user can see all of his opponents and make decisions regarding who to do battle with. I particularly enjoy no longer walking a few steps and having to fight a monster, and then walking a few more steps, and fighting another monster and then repeating that process a few more times before I reach the exit of the cave. The game play hasn’t become any easier, but it has become less frustrating. 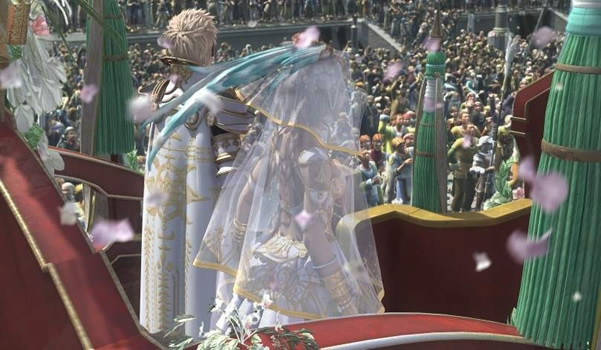 In the Final Fantasy spirit, Square Enix was required to put in excessive amounts of cut scenes. Videos play at certain points in the game; sometimes they go on for quite some time. Granted, the cut scenes help tell the story, but gamers are sure to become grumpy if they are disturbed from game play for an extended amount of time. Luckily, there is a skip button, so we need not watch any of the videos. The scenes are beautifully put together though. The graphics team has done a superb job of creating plenty of quality clips throughout the game. All in all, FFXII is a fresh new spin on the series. The new game play elements speed the game-play up and give FFXII a more mainstream appeal. Final Fantasy will always be the best 90+ hours someone can spend parked in front of the Playstation.